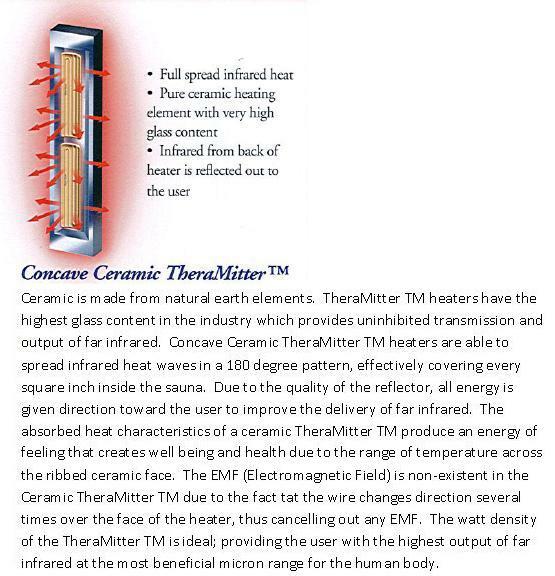 The best far infrared heating system is a solid Ceramic TheraMitter TM heater, because it is a proven system, while others like steel rod, aluminum, or carbon heating systems are touted as new technologies. The radiant efficiency of a heating material is an extremely important factor to its far infrared qualities. For this reason, ceramic TherMitter TM remains the gold standard for producing the most vital micron range of infrared for the human body. Does the size of the infrared heater matter? Our research has shown that physical size does not matter as much as the watt density of the heaters. The ideal infrared wavelength provided by the heaters within a far infrared sauna is more important than heater size. Some companies claim that large heaters are the best. The problem is that these large heaters have a very low watt density that produces an ineffective range of infrared and cannot heat the air inside the sauna effectively.